Hi! My name is Justina and I'm running the 2019 TCS New York City Marathon for South Bronx United (SBU), an organization I'm proud to be a U-19 girls soccer coach and Supporters Club Board Member with. SBU is a nonprofit youth development organization with a mission of using soccer as a tool for social change. SBU serves more than 1,100 boys and girls annually through programs on the soccer field, in the classroom, and in the community. 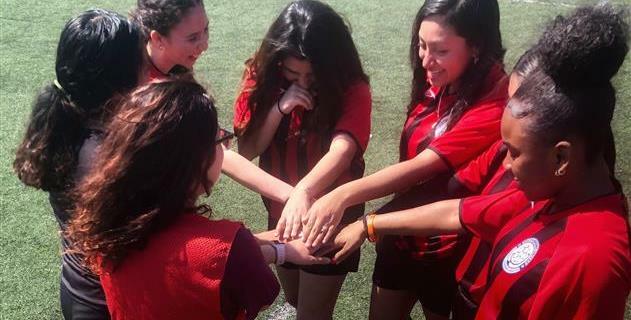 Founded in 2009, the organization's programs combine academic enrichment, college prep, mentoring, leadership development, health and wellness programs, immigration legal services, and other family and youth supports with recreational and competitive soccer programs. SBU participants range from ages 4 to 19 years old. The majority come from low-income, immigrant families and reside in the South Bronx, the nation's poorest congressional district. I love SBU and am excited to do my part in making a difference for the SBU community. Any support you can give would mean the world to me. And keep checking back for updates. I'll be posting pictures, fundraising event details, and marathon-day information up until November 3! This is my third season coaching with SBU, and the third season I've had the chance to work with this team of girls. Over these three seasons, I've watched them develop their skills individually and as a team. I've watched them laugh with each other, help each other, and teach each other. The most rewarding part about being their coach is hearing them on the field supporting each other, no matter what. That missed goal, it's okay! Just keeping taking your shot. Sigues adelante. Passing across the middle resulting in a turn over, my bad. I should have gotten open sooner. That amazing save, ESOOOO! TENEMOS QUE GANAR! Today I saw a different side of these girls. What started out as an exciting game against a new team turned into a frustrating loss. My girls were still talking to each other on the field, still supporting each other, but something was off. They were more physical but less tactical. They weren't stepping to the ball. They stopped defending. The girls on the team we played were taller, bigger, faster, but I'd never known my girls to back away from a fight. The look of defeat and anger was not something I'd seen with these girls over the past three seasons. Confused, I asked them what was going on. "Coach, these girls are racist. They're saying hella racist stuff to us out there." Every one of my girls echoed this. But they stuck it out and finished the game. And when it was over, they lined up and shook the other team's hands and then came back into our huddle and hugged each other. Hearing them repeat what had been said to them on the field ignited a helpless rage inside of me. But then watching them come together as a team to show each other so much love brought me back to reality. I'm not helpless anymore, I'm ready to fight. This was not the post I wanted to write to kick off my marathon fundraiser. I wanted to write something funny and lighthearted and maybe tell the story about the first time one of my girls ever stepped on a soccer pitch and she scored! Against our own team. But this story is more important. It's real and heart wrenching and unsurprising all at the same time. This isn't the first or last time these girls will face racism on the pitch. But having each other, this community that SBU created, lets them know that they're not alone in this. SBU is an integral part of the South Bronx community, giving my girls a support system of likeminded people to love and fight for them. To take a stand against racism on the pitch and advocate for their success. I'll fight alongside SBU for these girls I've grown to love so much. Will you? You’re an inspiration Justin’s. I am so proud of you!